Latin did not vanish with the Roman Empire. In the following millennium it remained the most important means of communication in literature and science in the Western world (we call it medieval Latin). The supposedly dead language even survived the Middle Ages and was still important during the modern period (Neo-Latin). We can study its legacy in the respective sources (handwritten books and early prints). Medieval Latin and Neo-Latin is not just a linguistic and literary degree programme, it also involves media and cultural studies. It is the central subject in philology (linguistic and literary studies) and historical studies of the Western culture in the period from 500 A.D. to 1800 A.D. The degree programme has a strong international and interdisciplinary focus. Only a few universities worldwide offer a Bachelor's degree programme in Medieval Latin and Neo-Latin, which can be studied as a first or second subject at FAU. In Bavaria, you can only study it in Erlangen. FAU is the only university in Germany which offers a Master's degree programme in Medieval Latin and Neo-Latin – although knowledge in medieval Latin is beneficial, or even indispensable, for many medieval subjects (such as history). Therefore, Medieval Latin and Neo-Latin is an ideal second subject in many degree programmes, especially in those with a medieval component. 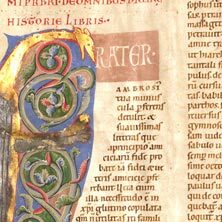 FAU offers a unique comprehensive training in medieval Latin and Neo-Latin, from the Bachelor's degree to the Master's degree to the doctoral degree and more (further training courses for researchers and teachers). excellent networks: we are involved in the Interdisciplinary Centre for European Medieval and Renaissance Studies (IZEMIR) and collaborate with other institutions such as the French National Library in Paris and the Bavarian State Library in Munich. Erasmus partnerships with the universities in Barcelona, Bergamo and Rome, Zurich, Brno and Olomouc, where you can study during the degree programme. Creating the study plan and registering for the courses (we also provide advice and support before the beginning of the semester; it is possible to register after the deadline). The courses of your choice may clash with those of the second subject (based on the study plan there should not be any clashes, but this may still happen in a few cases). However, as we are quite flexible, we can reschedule courses and meet individual needs. A lack of Latin proficiency (we offer language courses to obtain the required proficiency). The most important aspects are set out in an introductory event for new students at the beginning of the degree programme. This should help you avoid any potential problems.